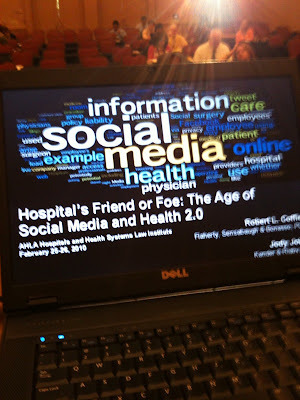 Today Jody Joiner and I presented at the AHLA Hospitals and Health Systems Institute on the use of social media by hospitals and health care providers. We provided an overview of social media use by hospitals and health care providers, discussed the pros/cons of using social media in the health care environment, presented case studies of the risks and legal implications and did a short role play involving tweets in the context of a medical negligence case. We also provided those attending with recommendations on developing social media guidelines and policies. To show the speed and ease of using social media tools to spread information, news and photos we we did some live shots during the presentations using an iPhone that were then loaded up to my blog, Twitter and Facebook. We then pulled up the posts and tweets at the end of our hour presentation. Great audience with great follow up questions. Thanks go out to Mark Browne (@ConsultDoc) and Peter Leibold (@HealthLawyers) for live tweeting during the session. Recently I was interviewed for a story focused on the changes to the HIPAA civil penalty enforcement under the HITECH Act. The article, Willful Neglect Is Difficult to Pin Down, but Can Result in Enormous HIPAA Penalties, appears in the Report on Patient Privacy: Practical News and Strategies for Complying with HIPAA, Volume 10, Number 2 February 2010 published by Atalantic Information Services, Inc. (AIS). The article discusses the definition and interpretation of "willful neglect" under the HIPAA penalty provisions. Health care privacy officers should find this article helpful in better understanding their role and responsibility in overseeing privacy compliance efforts. The full story was reprinted on AIS Health Business Daily website. Health and Human Services Secretary Sebelius and the National Coordinator for Health Information Technology, David Blumenthal, announced the HITECH funding under the ARRA for State Health Information Exchanges (HIEs) and Regional Extension Center (RECs) across the country. The White House Press Release provides a detailed list of HIEs and RECs receiving grants. Inormation is also available via the HHS News Release, Sebelius, Solis Announce Nearly $1 Billion Recovery Act Investments in Advancing Use of Health IT, Training Works for Health Jobs of the Future. More information about the health information technology programs and awards can be found on the Office of National Coordinator HIT Website. The Committee on Court Administration and Case Management of the Judicial Conference of the United States has issued a memo regarding Juror Use of Electronic Communication Technologies. At its December 2009 meeting, the Judicial Conference Committee endorsed a set of suggested jury instructions that federal district judges should consider using to help deter jurors from using electronic technologies to research or communicate about cases while they serve as jurors. The recommended instructions were developed as a result of the increased use of web enabled mobile phones and devices that can be used to research information and communicated in a variety of ways, including email, social media, etc. You, as jurors, must decide this case based solely on the evidence presented here within the four walls of this courtroom. This means that during the trial you must not conduct any independent research about this case, the matters in the case, and the individuals or corporations involved in the case. In other words, you should not consult dictionaries or reference materials, search the internet, websites, blogs, or use any other electronic tools to obtain information about this case or to help you decide the case. Please do not try to find out information from any source outside the confines of this courtroom. Until you retire to deliberate, you may not discuss this case with anyone, even your fellow jurors. After you retire to deliberate, you may begin discussing the case with your fellow jurors, but you cannot discuss the case with anyone else until you have returned a verdict and the case is at an end. I hope that for all of you this case is interesting and noteworthy. I know that many of you use cell phones, Blackberries, the internet and other tools of technology. You also must not talk to anyone about this case or use these tools to communicate electronically with anyone about the case. This includes your family and friends. You may not communicate with anyone about the case on your cell phone, through e-mail, Blackberry, iPhone, text messaging, or on Twitter, through any blog or website, through any internet chat room, or by way of any other social networking websites, including Facebook, My Space, LinkedIn, and YouTube. During your deliberations, you must not communicate with or provide any information to anyone by any means about this case. You may not use any electronic device or media, such as a telephone, cell phone, smart phone, iPhone, Blackberry or computer; the internet, any internet service, or any text or instant messaging service; or any internet chat room, blog, or website such as Facebook, My Space, LinkedIn, YouTube or Twitter, to communicate to anyone any information about this case or to conduct any research about this case until I accept your verdict.